“Glory Lasts Forever” will blow away anything you’ve seen in the Midsouth area all year! It takes place this Saturday night(October 10th) at The Herb Welch WrestlePlex, located at 1827 St. John Ave in Dyersburg, TN! Bell time is 7:30pm & tickets are ONLY $5! Checkout the updated lineup below! ***Title vs. 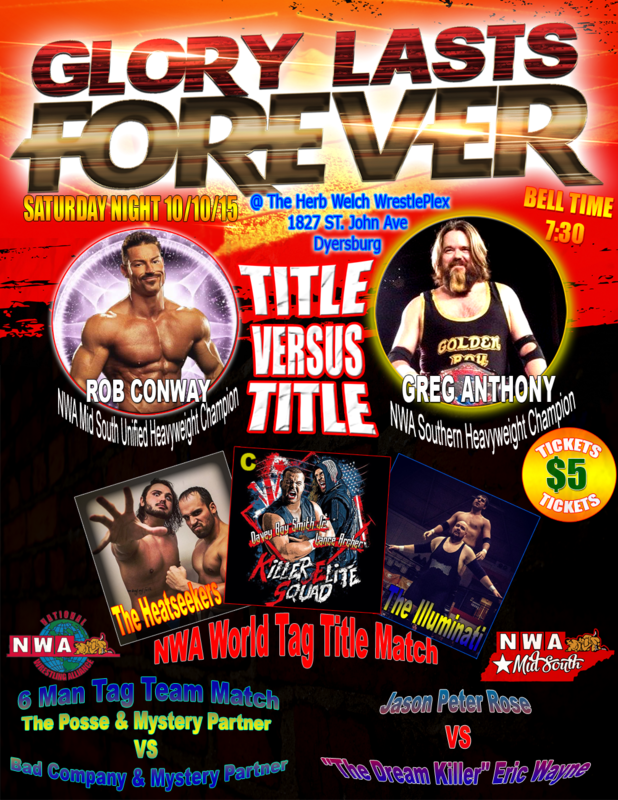 Title – WINNER TAKE ALL*** -NWA Mid South Unified Heavyweight Champion Rob Conway vs. NWA Southern Heavyweight Champion & Empire member “The Golden Boy” Greg Anthony! -The Champions, the Killer Elite Squad(Davey Boy Smith Jr & Lance Archer), defend the belts against The Heatseekers(Elliott Russell & Sigmon) and The Illuminati(Chase Owens & Chris Richards) in a Triple Threat match! -The Posse(Simon Reed & Lil Chris) and a Mystery Partner vs. NWA Mid South Tag Team Champions Bad Company(Van “The Man” VanHorn & Jeff Blair) and a Mystery Partner! -“The Enforcer of the Empire” Tim Storm will defend his title against a yet-to-be-named opponent! -Jason Peter Rose will wrestle his former tag team partner, “Dream Killer” Eric Wayne!